Wondering about The Outrigger Lagoon Fiji? Discover this popular family resort located along the famous Coral Coast region with tonnes of fun activities. - Who does The Outrigger on the Lagoon Fiji suit? Who does Outrigger Fiji suit? Suits people, especially families, wanting a luxurious big-sized resort with all the trimmings and plenty of activities at your fingers. It doesn't suit couples wanting a secluded quiet far flung island getaway. 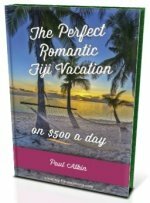 There plenty of options for these starting at our Fiji honeymoon section. 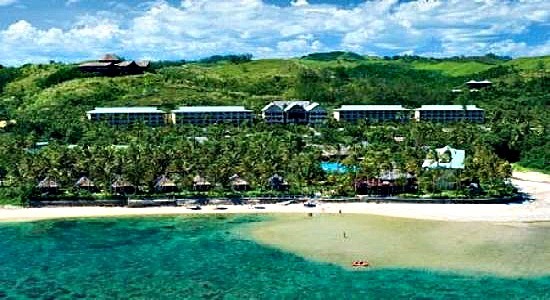 The Outrigger on the Lagoon Fiji is located on the Coral Coast, the tourist hub on the south coast of the main island of Viti Levu. The location lends itself to plenty of sights and activities on and off the resort. It's 80 kilometres (48 miles) from Nadi International Airport and a 5-minute drive from the tourist town Sigatoka. Coaches, taxis, rental/hire cars are all available at Nadi Airport. It's an hour drive to the resort. Helicopters are also available for a fancy scenic ride. Visit our Transfer from Nadi Airport section for details. 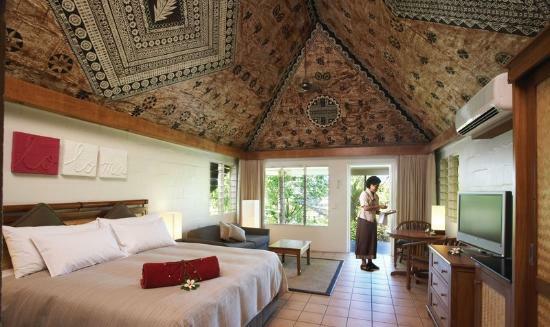 The Outrigger Lagoon Fiji has two main accommodation styles having 207 hotel styled rooms and 47 bures (bungalows). Sizes range from sleeping 3 (king size plus sofa bed) to family size sleeping 6. The bures, as shown to the picture below, has traditionally thatched roofs with vaulted ceilings. 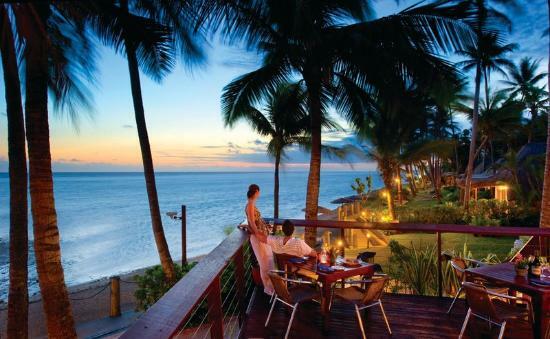 You won't go hungry at Outrigger Fiji, or thirsty for that matter. There are a total of 4 restaurants and 5 bars & cafes having a wide ranging taste of cuisines and locations, including a poolside bar in the adults pool. If you are too buggered from a hard day's swimming and tanning, 24/7 in-room dining is there to save you. 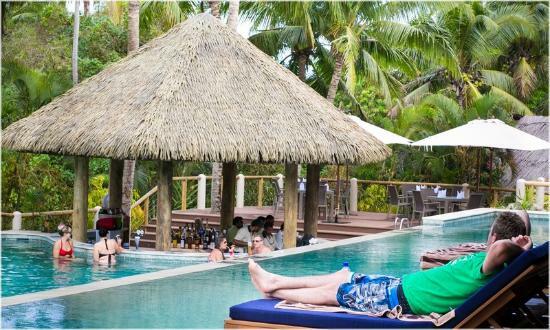 You also won't be bored at The Outrigger on the Lagoon Fiji if relaxing and doing nothing is taking it's toll. 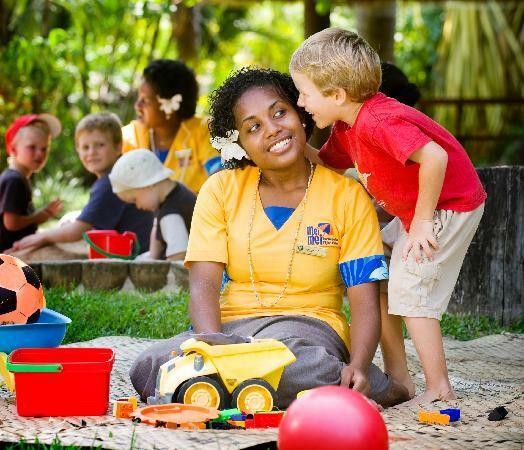 What makes some resorts in Fiji so family friendly, is the kids club. 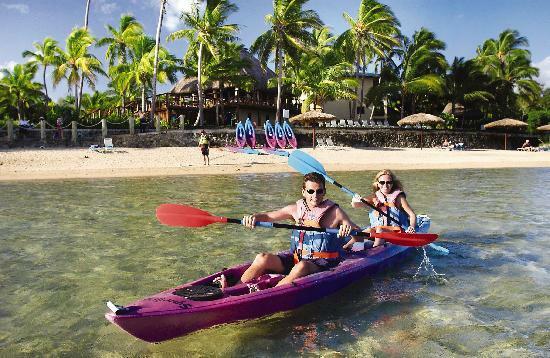 In The Outrigger Lagoon Fiji's case, the good news is, it has two. Better news, it's free for hotel guests. Your kids can be kept 'busy' from 9am up until 9pm at night, so you still get to have your holiday. The Meimei nanny system can give your child his/her own personal nanny for your stay. This is available for 8 hours a day and is for children aged 6 months to 12 years. There is a fee for this service.